I have posted several times about conventional film history and the many issues I have with it (links are at the end of this post). One such issue concerns deep focus and its history. In The Story of Film (2004, the book from which the series springs), Mark Cousins writes that in the 1940s "[t]he visual ideas of Welles and Toland started to influence John Huston and William Wyler" (p. 179). These quotes are just a few examples. A person who is reading a book or essay that mentions deep focus would almost certainly conclude that it was something that appeared in the 1930s in the films of Jean Renoir and then became common in the 1940s thanks to the innovations in Citizen Kane. What is puzzling is that this is transparently wrong. 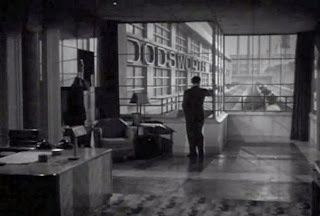 Despite these claims many major filmmakers such as Kenji Mizoguchi, Frank Borzage, Howard Hawks, Sadao Yamanaka, Alfred Hitchcock, Henry Hathaway, William Wyler and John Ford used deep focus all through the 1930s, and earlier. Another key player was cinematographer James Wong Howe. Contra Cousins's statement it should be said that Wyler's films in the 1940s look rather like the films he made in the 1930s, deep focus and all, but not really like Welles's films. Generally Welles is more baroque and expressionistic whereas Wyler is more calm and naturalistic. 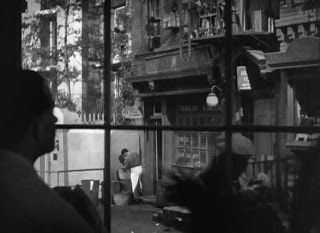 An exception perhaps is Wyler's Dead End (1937), which Toland shot, and which is rather expressionistic, both in its use of depth and lighting, more so than usual for Wyler. But that was of course several years before Citizen Kane. If anybody influenced anybody it was Wyler who influenced Welles. But it is not just certain major directors that were using deep focus, all kinds of films by all kinds of filmmakers from all over the world used deep focus, from random B-movies to the Art Deco glory of Fred and Ginger musicals. It should further be noted that deep focus did not appear suddenly in the 1930s either, it was always there. To take one magnificent example among many; in Ingeborg Holm (Victor Sjöström 1913) there is a sequence where a man (husband and father) is dying in the bedroom, succumbing to an illness, while in the next room, in the back, his children are playing and through the doorway we see them, oblivious of their father's death struggle. Instead of cutting back and forth, Sjöström shows both rooms at the same time, in the same shot, and this requires depth. This is just after the wife has discovered that he has died. F.W. Murnau was another master of deep focus compositions. Here is an example from The Last Laugh (1924). 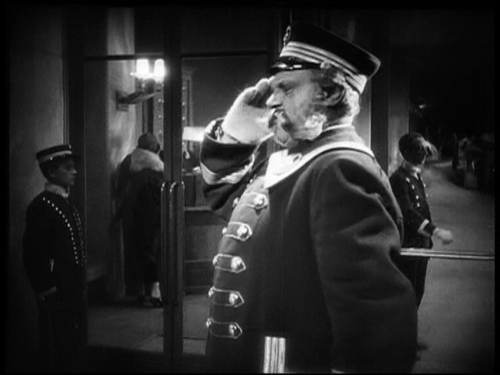 So there is nothing new or special about Renoir's and Welles's use of deep focus. Actually, in itself deep focus is not particularly special at all. It is how you use it that matters, not that you use it. Here is an image from Make Way For Tomorrow (Leo McCarey, 1937), with a lot of depth, but the depth has a different meaning than in the examples above. Here it is to emphasis her solitude, like if she was modelling for an Edward Hopper painting. 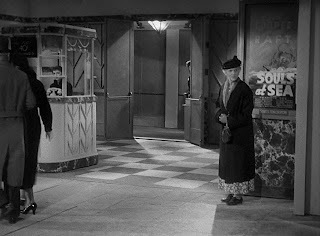 On the right in the frame there is a poster for another film from 1937, Souls at Sea, by Henry Hathaway. That is a film that has a more expressionistic visual style, and often dazzling use of depth, and perhaps an influence, among many others, for Welles and Toland when they made Citizen Kane, not least its use of cramped sets with visible inner ceilings and canted angles. Another master of deep focus was Raoul Walsh, all through his career, from 1915 and onwards. His use of it is a visual expression of his ideas, and remarkable both in its depth and in its meanings. One day, hopefully, it will seem as strange to write about deep focus without mentioning Walsh, and James Wong Howe, as it would be to write about post-war Swedish cinema without mentioning Ingmar Bergman. Where these mistaken ideas come from is not clear, possibly with André Bazin's writings on deep focus in the late 1940s and early 1950s, for example the essay "The evolution of the language of cinema". It seems film scholars are more keen on reading books than watching films, and since most books write the same things the mistakes and errors continues. But by looking at films from the 1920s and 1930s it is easy to see how prevalent deep focus was, and in how many different ways it was being used. A film like Ford's Stagecoach (1939), that used expressive deep focus before Citizen Kane, is usually described as a rare precursor. Instead it should be seen as a good example of a rather common form of filmmaking. Often when film history gets distorted it is in order to simplify but that is not the case with the history of deep focus. It is not less simple to rightfully say "Deep focus has been a tool used by many filmmakers since the dawn of cinema." instead of wrongfully claim "Deep focus tentatively appeared in the 1930s and then became common after 1941." Another thing to keep in mind is that what appears to be deep focus is sometimes an illusion, through matte paintings, set design or trick filming (such as splicing two different shots together through an optical printer), and not technically deep focus at all. This is the case with some of the most famous shots from Citizen Kane. Special effects has been used ever since the dawn of cinema, and that includes faking deep focus. The eagerness to equate deep focus with Gregg Toland becomes comical in The Film Experience - An Introduction (2009). There his work on Wyler's The Heiress (1949) is mentioned (p. 102) which is peculiar because it was made after Toland's death. Leo Tover was its cinematographer. I suspect this is a problem most academic areas need to deal with. We want simple and easily interpreted boundaries but so very rarely get them. There are always overlappings a grey zones. This said, without having studied the field myself, I have to say that I agree that it would be a more interesting discussion on how to use a specific technique, rather than the simpler "Using it? Y/N?" Actually, this time I don't think the problem stems from a wish to keep it simple and easy, I think it is due to a lack of awareness. To say that 'there is nothing new or special about Renoir's ... use of deep focus' I think is misguided. Firstly, as you sort of allude to but don't really follow up on, Renoir was a dedicated user of deep space and depth staging, not deep focus. If you look at The Rules of The Game, you can see that focus is pretty soft and changes regularly. However, to the extent that deep focus and depth staging are often confused and that people mean the latter when they say the former, Renoir's use of the latter is extraordinary, and to say that there is 'nothing special' about it, I think, shows a want of sensibility. I'm not trying to belittle Renoir. He's one of the great artists of the 20th century. My point is that he was not the first and not alone in staging in depth. That's the only thing I meant by him not being new or special (perhaps unique would've been a better word). His artistry is not being disputed!